Cultivate it from seedlings in spring and fall, as it doesn’t grow well in heat (during summer, plant in shade and water regularly). When the plant starts to form a flower, cover with its leaves to keep the quality. At least 45 cm (18 in) between rows and at least 45 cm (18 in) between plants in a row. You can plant bush beans or overwintering lettuce between the rows. Three to five plants per person. February-March for seedlings, which should be transplanted until the end of April. Later, plant in shade. To use in fall, sow from July to mid August (shade the seedlings) and transplant until mid-September. It germinates in 10 days. Fertilize with barn manure or home compost. Grow in the first field. Till the soil regularly to enable nutrients to the plant. It grows well when planted after or beside beans, when organic mulch is used and watered with nettle and algae brew. Be moderate with nitrogen; use it only until the flowers start to develop. Lack of boron can prevent flower development. Cauliflower is a demanding crop. Water regularly especially when transplanting and when it develops the flower, but be careful the soil doesn’t get stiff. Celery, Swiss chard, broad beans, endives, beans, peas, tomato, spinach, lettuce, calendula, mint, chamomile, thyme. Black rot, clubroot, caterpillars of butterflies and moths, larvae of cabbage root fly, swede midge. To prevent disease, let the soil drain well, fertilize moderately, till and water with algae brew. Do not plant brassica vegetables in the same place for four years. Against pests, cover with garden fabric, intercrop with celery, lettuce or spinach, and put tomato leftovers between the plants. 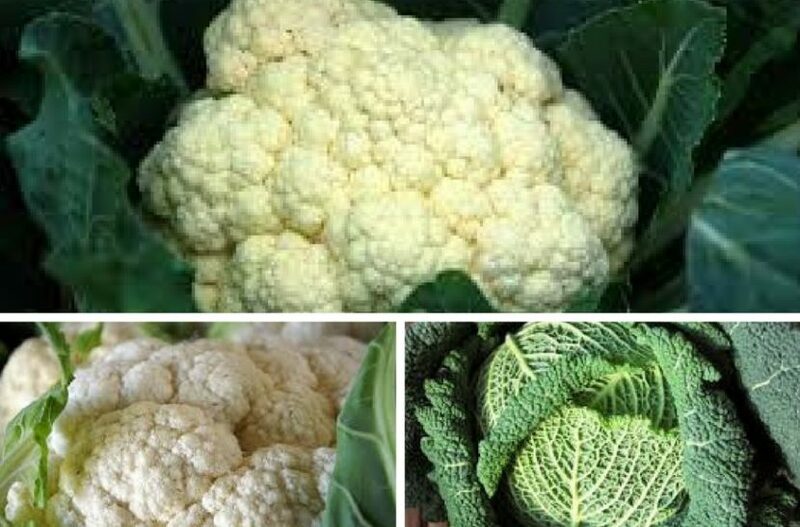 Cauliflower is best if cut regularly before use, and can be kept in the fridge up to one month. It can be frozen as well: first blanch for 4 minutes and put shortly in cool water beforehand. Use the meaty flowers. Cauliflower contains all the important vitamins (except for vitamin E) and minerals. Because we eat its flowers, follow the days for flowers in the sowing calendar. Make shades for the plants when the flowers reach 7 cm (3 in) – bind the leaves together with elastics over the flower or break them and cover it. The earliest sorts ripen in 50 days after transplanting, the latest ones in 100. It is the most demanding brassica vegetable.